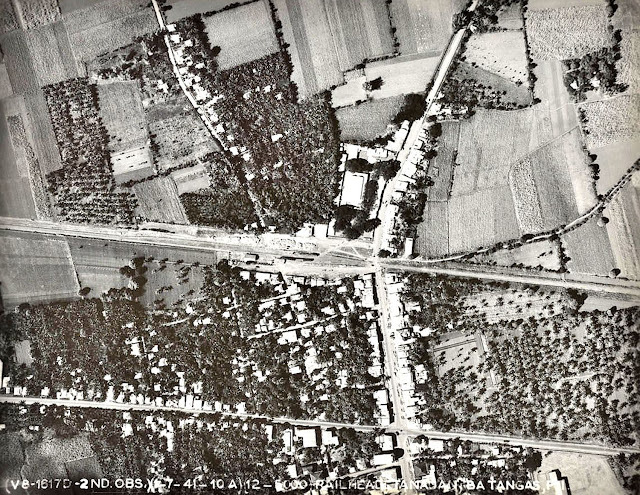 An aerial photograph of Tanauan taken in 1941. Image source: United States National Archives. The photograph above was taken on the 1th of March 1941, likely by the same aircraft that flew from Nichols Airfield (present-day Villamor Airbase) and took the two photographs on the nearby town of Malvar, Batangas that are also featured in Batangas History. It was originally captioned “Tanauan, Batangas Province, Luzon Island, P.I. (for Philippine Islands) – Railhead,” a railhead in the context of the photo being “a railroad depot at which supplies are unloaded to be distributed or forwarded by truck or other means1. The photograph was downloaded from the United States National Archives.